Many would agree that St. Thomas and St. John offer the finest dining choices in the Caribbean. Both islands are home to many, small, unique, wonderful restaurants. Because of this, a very popular evening event for a group is an organized “dine around”. The group is divided up and each smaller group heads off to experience one of the many wonderful restaurants we have on St. Thomas and St. John. We recommend only the finest restaurants and organize the entire evening. We work very closely with each of the restaurants in the planning process. In each case they have provided us with their pre-selected menus that we can share with you. The options for fine dining on St. Thomas and St. John abound. We’ll gladly suggest, and then you decide. IMI will arrange private dining for your party with the menu of your choice, a dinner with a specific theme, or an all-out party including menu, decorations and entertainment. IMI’s carefully chosen dining locales guarantee a night to remember: perched on a hillside overlooking harbor or sea, nestled at the water’s edge, set in tropical gardens where the breeze bears the scent of frangipani. . . Add elegant table appointments, the glow of candlelight, and the finest of wines, superb service, and the cuisine of true culinary artists. . . For your palate, and for all your senses, each evening out promises pleasure in our Paradise. Sail off into the sunset for cocktails and hors d’oeuvres and end up at an awaiting beach party or restaurant. High atop Charlotte Amalie Harbor be dazzled by magnificent sunsets. As you sip cocktails watch cruise ships and yachts glide into the shimmering evening lights. Informal elegance and attentive staff invite you to relax and savor Executive Chef Kevin Mc Caffery’s classic and creative cuisine. Be it our steakhouse, lobster or seafood, Chef’s international menu is a feast for the eyes and palate. Be tempted by house-made desserts. Our key lime pie is famous and Godiva Chocolate Brownies decadent. Enjoy the freshest local seafood and indulge in worldly favorites while overlooking the sparkling Caribbean Sea that serves as Bleuwater’s inspiration. Bleuwater is the Ritz-Carlton’s fine dining restaurant where guests enjoy a casually elegant dining experience in the beauty of the air conditioned dining room with floor to ceiling French doors that open to the beauty of Great Bay. For those who prefer to dine al fresco, the restaurant offers patio and terrace seating. Blue Orchid Restaurant and bar at the historic St Peter Great house offers Island inspired cuisine set amongst classic Caribbean architecture. Nestled high on the mountain with incomparable views of St Thomas and the Down Islands amongst a spectacular garden setting. The Freshest Option in Casual Fine Dining on St Thomas…Caribbean Fish MarketWhether you prefer to dine beach-side on one of 3 covered patios or inside of our open-air restaurant, the calming breezes of Cowpet Bay will only add to a spectacular dining experience. Our Caribbean inspired menu brought to you by talented chefs with diverse culinary backgrounds, offers steaks, chicken and vegetarian choices all expertly prepared and artfully presented. Of course, fish is the star of the show!! Supporting our local fisherman, we are able to provide the freshest seafood items available. Boasting the Wine Spectator Award of Excellence, our carefully selected list will offer something for every palate. Located at the tranquil Elysian Beach Resort! Grande Cru is located at the exclusive Yacht Haven Grande Marina “Winter Home” of some of the world’s largest mega yachts. The restaurant offers the finest Mediterranean inspired cuisine fitting its décor and environment. Cordon Blu Trained Chef/ Operator Patricia La Corte uses only the freshest ingredients to create a cutting edge menu served in a totally hip ambiance. Global Cuisine with a Caribbean Twist!Located at the Ritz-Carlton Residences on St. Thomas’s East End, this award winning restaurant offers a dramatic Down Island views! With a dramatic view of Great Bay, the Award Winning Eatery offers Hot Starters Featuring House made Gnocchi & a Burratta Salad. Temping entrees prepared by our trained chefs include such items as Certified Angus Beef both Filet & Strip Steaks, roasted New Zealand Lamb, Tiger Shrimp Pad Thai & a crowd favorite, Caribbean Lobster Tagine! This restaurant offers Global Cuisine with a Caribbean Twist! Located directly on Morning Star Beach, St. Thomas’ newest entry to fine dining blends tropical serenity with cutting edge chic. Guest enjoy ocean front, open air, dining. They truly offer an extraordinary combination of ambiance, style, and culinary artistry featuring “Latin-fusion”. Cuba’s cool vibes meet the refreshing energy of the Pacific Rim describes the entire dining experience. 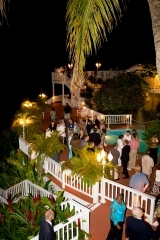 Sitting directly on the water’s edge at the mouth of Charlotte Amalie harbor, Oceana now occupies the historic Villa Olga. The estate dates back to the early 1800’s and became the Russian Embassy in 1894. It has housed restaurant’s in the past and in the fall of 2003 Patricia LaCorte, one of St. Thomas’ foremost chefs and restaurateurs, took over the property and completely transformed the interior. Together with her expert culinary staff they are serving the finest continental cuisine and feature fine seafood with a wide variety of items that change daily. Over two centuries ago “The Old Stone Farm House” was the hub of a 250-acre Danish sugar plantation called Estate Loveland. The two feet thick walls have withstood countless assaults by wind, fire and storms which have failed to do anything but burnish the charm of this lovely building. The Old Stone Farmhouse offers the ambiance and historical nostalgia of a bygone era of St. Thomas. Elegant Italian dining on St Thomas’ East EndPesce’s Fare reflects the culinary sensibilities of the Italian people: rustic yet sophisticated. Our Blending of herbs and spices, a profusion of fresh ingredients and the creativity of chefs all with varied backgrounds add a contemporary twist in the creation of phenomenal cuisine. Being knowledgeable of the beautiful relationship between food and wine – served with the warmth and hospitality of the Italian people are all elements designed to delight our dining public. Located in American Yacht Harbor in Red Hook, Pesce also features an award winning wine list & an impressive variety of hand-crafted cocktails. Casual, Beachside Fine Dining on St Thomas’ East EndWelcome to Sunset Grille. Located at the Secret Harbour Beach Resort, we are approachable, yet upscale with a menu built on the classic elements of the American steakhouse – with modern, creative twists and turns throughout. Incorporating both chef- inspired composed dishes and a build-your own style of menu, we let you make the choice!! We believe that great food starts at the local level and we make every attempt to buy locally. The menu is prepared from scratch daily & the décor chic, warm and inviting. Experience the magnificent sunset, from which we drew our name, in our open-air dining room. Housed on the first floor of a 200-year old Danish home located in the heart of downtown Charlotte Amalie, Virgilio’s is an intimate, air-conditioned room serviced by attentive staff. The art-covered walls, crystal chandeliers, stained glass windows and soft Italian music create a decidedly romantic mood. Over 40 homemade pasta dishes are offered as well as numerous Veal, Lamb, Chicken and fresh Fish specialties. After dinner, Virgilio’s Cappuccino (with the aroma of Italian liqueurs) is the perfect finish.